As a vegan, one of the most common things you can expect to hear from omnivores (aside from “where do you get your protein?”) is “Do you just eat lettuce all the time?”. No. We do not just eat lettuce all the time. BUT WHEN WE DO..we like to do it right! We have always enjoyed a good salad, which can be surprisingly hard to come by. 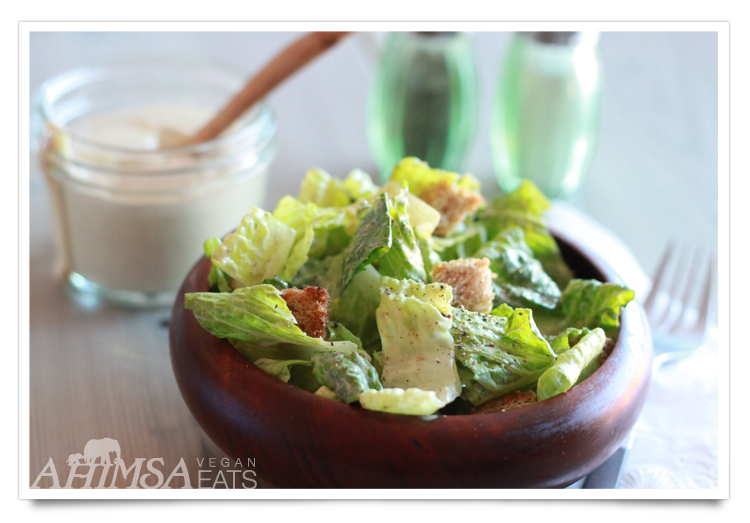 Ever since we were children, there was always one particular salad that we were drawn to: the classic Caesar. Rich and creamy, with the spiciness of raw garlic accompanied by the acidity of lemon juice and mellowed by parmesan cheese, this salad was at the top of our list whenever we went out to eat. It was our personal mission to try every Caesar salad that we could get our hands on. We could instantly tell if it was bottled dressing, or something they lovingly created in the kitchen. It was, in our humble opinions, the distinguishing factor between a good restaurant, and a great one. Luckily for us, our father has always excelled at making a Caesar dressing that became our standard for all others. It was not until years later that we learned that anchovies were a typical ingredient in our number one choice of dressing. Well, as a vegetarian, that just wasn’t going to work anymore. Our loving father revamped his famous dressing to lighten up the fat, and cut out the anchovies to create a new, but equally delicious dressing. Theeeeen, vegan happened. Suddenly he was no longer allowed to use cheese, eggs, traditional Worcestershire sauce..basically any of the ingredients that make the dressing what it is. But our father loves us, and could not stand to see us go without (mostly because we insisted we still needed it in our lives). With a few substitutions, we now get to dive in a much healthier, but equally as indulgent classic Caesar salad, and all is right in the world. Makes 2 1/2 cups dressing. NOTE: Feel free to add an additional squeeze of lemon and fresh cracked pepper to your salad, we always enjoy a little extra tang. This dressing will keep for up to 1 week in the fridge.